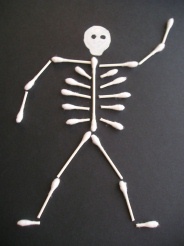 This Q-Tip Skeleton is an easy and inexpensive Halloween kids craft. This would be a great activity for preschoolers to add some spooky to the holiday! 1. On your black paper, paint on your skeleton's face near the top of the page. 2. Cut your Q-Tips in various sizes. Use them to create a scary skeleton on your black paper. Glue all of your Q-Tips in place and you're finished! Click here to find more Halloween Crafts like the Q-Tip Skeleton!